By Nick Dearden, director of campaigning organisation Global Justice Now. Scotland has established impressive radical political credentials in the last two years (particularly when compared to the rest of the UK). It has shaken a complacent Westminster elite to the core, and proved that disengagement from politics can be overcome. in the European context, Scotland follows on the heels of Greece and Spain in presenting a direct challenge to the austerity programmes being imposed in the interests of big banks by European elites. But as the screws are applied ever tighter to Greece, it becomes clearer that in changing Scotland and changing Britain we are stronger when we connect with these kinds of struggle across Europe and around the world. Our organisation works in Scotland and across the UK, linking in with social movements around the world. And because we see so much hope for change in the new Scottish reality, as well as links to positive change around the world, we’re focusing our annual conference in Glasgow next Saturday on internationalism, global solidarity and their place in the new Scottish landscape. At the heart of this lies the need to challenge the economic system that imprisons us and permeates the decisions that governments take on domestic and international policy. This requires changing the common perception that there is no alternative and it means challenging the so-called ‘free market’ model, which is in fact a system for the promotion of corporate interests and power, and sees the state as no more than a provider of funds and enforcer of rules which benefit a small handful of mega corporations. Successive Westminster governments have been at the forefront of pushing neoliberalism onto the world, from Margaret Thatcher onwards. So we in the UK have a special responsibility to roll back these policies, which means, for example, stopping the British government from using the aid budget as a slush fund for corporate interests and use it instead to build decent welfare states around the world; stopping the disastrous US-EU trade deal (TTIP) and related bilateral trade deals in their tracks and supporting Latin American calls for a new tax treaty and an international court to hold corporations to account for human rights abuses, challenging the British block on tougher financial rules at an EU level and instead ‘shrinking the city’ and rebalancing our economy. None of this will happen just through electing politicians. Even where politicians are elected on progressive platforms – and there are a number of welcome proposals in the SNP’s demands – they operate under acute constraints, which is why popular mobilisation is always so important. The incredible impact that activism in Scotland is already having on policies and power dynamics which seemed ‘untouchable’ gives a real sense of hope. Redistributing land is barely talked about as a major political issue down south, yet it is now on the Scottish agenda. That gives people in Scotland a tangible connection with small farmers throughout Africa whose common land is being taken over by big business. In Scotland, there is also inspiring work on food sovereignty – giving people more control over food production and quality – on decarbonising our economies by setting up locally controlled energy systems, on challenging privatisation by building more accountable public services. All of these have relevance for global policy, and the struggles going on in Scotland mirror struggles going on across the world. 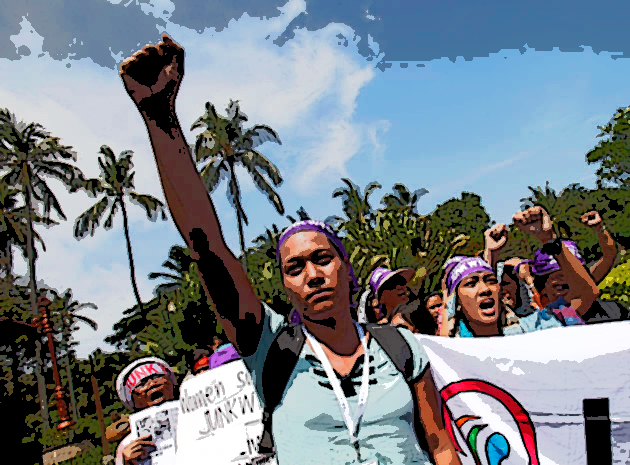 The most important thing activists can do for counterparts around the world, including in the global south, is precisely to fight and win these battles – because nothing is so challenging as a positive example. But in our activism we can also build in a global dimension – discussing and sharing with those around the world in similar situations. This also helps move us away from the sort of patronising perspective which has dominated our discussions of the ‘third world’ for too long – that they have their own issues which can be solved through charity. In coming years, then, we hope to continue to work with movements in Scotland to precisely build this global dimension. To see where international experiences can give strength Scottish movements. That’s why we’re bringing a Nigerian environmental justice activist to our event next weekend. And hopefully we will see where Scottish victories can give hope to struggles elsewhere. We hope land reform will be a key victory – because we can’t make land distribution fairer in Scotland while our corporations are snatching up much needed land across Africa. We also hope to continue have a role in mobilising around international issues like TTIP. We have gained so much hope and strength from the upsurge of activism in Scotland. We now want to say, we only change Scotland by changing the world and we only change the world by changing Scotland. Our conference takes place in Glasgow on 13 June. For more info and to register see here. It’s followed by Shifting Sounds, an evening of live music and poetry at the Rum Shack that evening. Totally agree with the above,we have to make as many contacts world wide as possible. There no real escape unless you’ve built up an oil fund like Norway but even they are bound by trade agreements and geo political conflicts made elsewhere..There are activists like Yash Tandon in his book Trade is War that suggest the only other real alternative is to decouple from the USA/EU Western block.In our case that would mean leaving the UK and the EU. The privatisation of Royal Mail is a case in point as its driven by an EU directive to introduce competition in all its member states postal sectors and in Holland this has meant reducing the USO from six days a week to 5 days a week. The purpose of this EU directive is to promote theft of government assets and hand them over to a financial elite. We may not be lunatics be we are still in the asylum. Quite simple, just arrest the Rothschilds and David Rockerfeller, problem solved !! I think global connections are important because we need to move from the euro centrist idea that We need to teach the world. As the posting above implies these are problems arising from Globilization and the control that corporations have over the process. Perhaps we may learn from others how they are tackling the challenges imposed on us all. After all most corporation speak with one voice and their Values are based on Profits. Ours are based on achieving a fairer society. But why does the SNP get away with it, when their policy and overall framework of governance is no different from UK’s EU’s and firmly within the parameters of the neoliberal consensus. Just this week Sturgeon was gushing about the EU and deeper integration and the SNP are in practice fully behind TTIP. Similarly the white paper was all about reducing corporation tax and boosting oil revenue. Also the initial land reform legislation was introduced by the lab/lib government, with community right to buy, and the SNP have done nothing more despite 8 years in government? How can you trust their commitment. Even the legislation set out, although good is not especially ‘radical’, primarily because many tenents don’t want ownership reform, they can’t be arsed with the hastle, what they want (from my teuchter experience) is well managed estates that diversify the economy, provide jobs with strong legal protections against eviction and absentee landlords. And protection against landlords selling off the land to developers which the SNP has actively promoted due to their ties with the building lobby. Go up to Aberdeenshire and see the vast estates of ‘luxury’ homes (not affordable ones) so that locals and the young are priced out, and let’s not mention the Mennie Estate! And just recently Highland council coalition split. I’m sure there is politics here but there is truth in the claim that SNP are wholly run from the central belt, that control is being assert from the top down. Also, I’m not sure how food sovereignty helps ‘developing countries’. The cash crop economy is vital for many communities. Surely the issue is fair trade, allowing smaller countries to protect their nascent industries rather than letting predatory multinationals swoop in and take over. All food sovereingty does in western ‘rich’ countries is put small scale farmers in ‘the third world’ out of business. Greed creates poverty like the turning of the wheel. Btw, great article. The Left in Scotland could do with inviting the best economist in the world Prof Michael Hudson to speak about neo liberal economics and the Neo Feudal elite who run this money grabbing system to suit the 1%. I heard one ‘expert’ a few weeks ago talking about ‘deflation’ and he had NO IDEA what deliberately managed debt deflation is! He had a total ignorance of how neo liberal economics is managed by the elites and he is on the ‘left’. We need to sharpen up our critique like a laser……. Totally agree regarding Michael Hudson Paddy. Bella/Common Weal/Left Project/Greens should try get him oer for a debate. LOVE TO HEAR WHAT THE GUY HAS TO SAY, BUT THAT DOES NOT REQUIRE US TO SPEND LIKE WE HAVE 100 MONEY TREES AT OUR DISPOSAL. Global capitalism is the biggest challenge and threat to working peoples standard of living and advancement. Governments are in the thrall off multi national corporations who move their businesses from country or another at the drop of a hat when they feel threatened or in the belief that costs will be lower (such as wages). They are anti trade union, as trade unions affect costs directly (improved wages) and indirectly (by adhering to workers safety legislation). Therefore anything that distracts working people from that belief ensures the status quo. That is why in the pursuit for independence, Scots must be careful not to lose sight that in the working environment, unity is strength. Multi national corporations have no borders. 1ST OUR LANGUAGE. 2ND AN INDEPENDENT SCOTLAND AT THE SAME TIME OUTTHINKING THE LARGE CORPORATIONS.